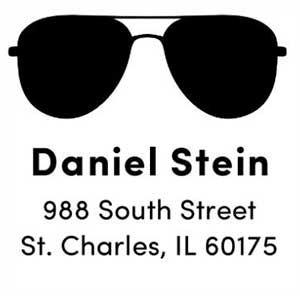 Image shown larger than actual stamp. 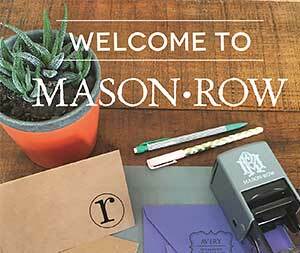 This self-inking stamp from Mason Row is sure to impress and makes a great gift! Add an elegant touch to notes, envelopes, announcements, bookplates, recipes, handmade creations and even the gift of wine. Every Mason Row stamp comes with a fully inked pad in Midnight Black. The water-based inkpad will last for 800-1000 impressions. Colored inks are also available in a wide variety of colors (sold separately). Our custom dies are laser engraved rubber, which guarantees a superior impression every time. The actual personalized text size may vary depending if it needs to be adjusted to fit the available space in the stamp image. Stay up-to-date with the latest news & trendiest products direct to your inbox. Copyright © 2019 Mason Row Your destination for custom stamps and embossers. All rights reserved. SIGN UP AND BE THE FIRST TO KNOW ABOUT NEW PRODUCTS, EXCLUSIVE DISCOUNTS, GIVEAWAYS + MORE! * Not valid for gift cards and voucher purchases. Offer applies to new subscribers and cannot be combined with other promotions. Coupon valid for 30 days.